At the outset, it appeared that the DOL’s Home Care Rule would not survive judicial scrutiny, when the U.S. District Court for the District of Columbia vacated both major provisions of the Rule – the third-party exclusion on December 22, 20142 and the companionship services definition on January 14, 2015.3 However, the DOL appealed4 these decisions, and on August 21, 2015, the U.S. Court of Appeals for the District of Columbia Circuit (“D.C. Circuit”) upheld5 the Home Care Rule and reversed the district court’s decisions vacating the major provisions of the Rule. After the district court entered6 summary judgment in favor of the DOL on October 20, 2015, the Home Care Rule went into effect. The plaintiffs sought review7 by the Supreme Court of the D.C. Circuit’s decision, which has just been denied. Since the Home Care Rule went into effect, the number of wage and hour lawsuits against home care companies has increased dramatically. Below is snapshot of the breadth lawsuits alleging violations of the FLSA against home care and home health care entities that have been filed in federal court. 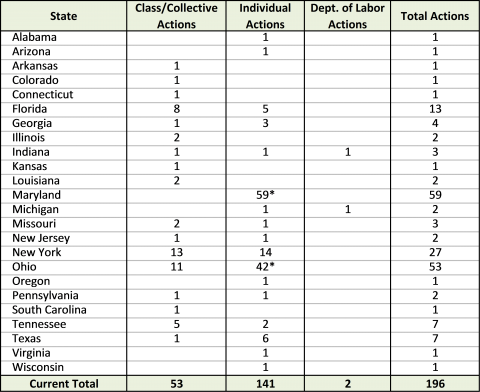 While not separately tracked, the state court filings are typically more than double the federal court actions, meaning more than 600 separate wage hour lawsuits have been filed against home care companies in the last eight months. States such as California, New York, and Colorado have been fertile ground for lawsuits alleging violations of state wage hour laws. These lawsuits often concern the compensability of sleeping time, meal time, and/or travel time. *Note: The Maryland single-plaintiff filings and 40 of the Ohio single-plaintiff filings arise from the decertification of a large class case. In addition to the risk of private suit, the home care industry faces increased attention from the DOL. In late March, the agency issued “A Guide for Consumers and their Families to the Fair Labor Standards Act,”8 (the “Guide”) which purports to educate private household consumers, their families, and home care workers on the federal wage and hour requirements that now apply to home care workers. The Guide instructs consumers that they may be considered the employer of a home care worker: “If you hired the home care worker directly, and no agency or other organization is involved, then you are an employer.” This guidance, while oversimplifying the “economic realities” test used to determine whether an individual or entity is the employer of another, nonetheless illustrates the DOL’s very broad position on the employment status of home care workers. Furthermore, the DOL reiterates that, given the narrowing of the definition of companionship services, even an individual consumer is likely responsible for the payment of minimum wage or overtime: “If you use or manage the services of a home care worker, you may be responsible for paying minimum wage and overtime, and for keeping certain records regarding your home care worker(s).” Accordingly, the companionship exemption is rarely a safe harbor, even for the individual consumer. However, with respect to vertical joint employment (e.g., an “employer” household consumer and an intermediary entity such as a nurse registry), the AI announces that it will abandon the current FLSA joint employment regulations. Instead, the DOL will apply the "economic realities" test in evaluating the relationship between or among the entities at issue. In the context of the home care industry, the DOL may deem an individual consumer the “small employer” to expand statutory coverage to a “large employer,” like a nurse registry that refers home care workers to such consumers. A. Directing, Controlling, or Supervising the Work Performed. To the extent that the work performed by the employee is controlled or supervised by the potential joint employer beyond a reasonable degree of contract performance oversight, such control suggests that the employee is economically dependent on the potential joint employer. The potential joint employer’s control can be indirect (for example, exercised through the intermediary employer) and still be sufficient to indicate economic dependence by the employee. See Torres-Lopez, 111 F.3d at 643 (“indirect control as well as direct control can demonstrate a joint employment relationship”) (citing pre-1997 MSPA regulation); Antenor, 88 F.3d at 932, 934; 29 C.F.R. 500.20(h)(5)(iv). Additionally, the potential joint employer need not exercise more control than, or the same control as, the intermediary employer to exercise sufficient control to indicate economic dependence by the employee. B. Controlling Employment Conditions. To the extent that the potential joint employer has the power to hire or fire the employee, modify employment conditions, or determine the rate or method of pay, such control indicates that the employee is economically dependent on the potential joint employer. Again, the potential joint employer may exercise such control indirectly and need not exclusively exercise such control for there to be an indication of joint employment. C. Permanency and Duration of Relationship. An indefinite, permanent, full-time, or long-term relationship by the employee with the potential joint employer suggests economic dependence. This factor should be considered in the context of the particular industry at issue. For example, if the work in the industry is by its nature seasonal, intermittent, or part-time, such industry condition should be considered when analyzing the permanency and duration of the employee’s relationship with the potential joint employer. D. Repetitive and Rote Nature of Work. To the extent that the employee’s work for the potential joint employer is repetitive and rote, is relatively unskilled, and/or requires little or no training, those facts indicate that the employee is likely economically dependent on the potential joint employer. E. Integral to Business. If the employee’s work is an integral part of the potential joint employer’s business, that fact indicates that the employee is likely economically dependent on the potential joint employer. Whether the work is integral to the employer’s business has long been a hallmark of determining whether an employment relationship exists as a matter of economic reality. See, e.g., Rutherford Food Corp. v. McComb, 331 U.S. 722, 729-30 (1947). F. Work Performed on Premises. The employee’s performance of the work on premises owned or controlled by the potential joint employer indicates that the employee is likely economically dependent on the potential joint employer. The potential joint employer’s leasing as opposed to owning the premises where the work is performed is immaterial because the potential joint employer, as the lessee, likely controls the premises. On April 25, 2016, the WHD published a Field Assistance Bulletin (“Bulletin”) discussing the exclusion of sleep time from hours worked by domestic service employees. In this discussion, it divided employees into three categories: (i) those who reside at the worksite ("live-in" employees); (ii) those who work shifts of 24 hours or more; and (iii) those who work shifts of less than 24 hours. The WHD first reiterated the definition for a true live-in domestic service employee: an employee who resides at the private home in or about which he or she provides household services. The WHD then repeated its longstanding definition of a live-in employee as one who resides at his or her worksite: (i) on a "permanent basis," i.e., stays there seven nights a week and has no other home; or (ii) for "extended periods of time," i.e., works and sleeps there for five days a week (120 hours or more) or five consecutive days or nights (regardless of whether the total time is at least 120 hours). An employer of a live-in employee who resides at the home on a permanent basis may exclude up to eight hours of sleep time each night as long as the employee is paid for some other hours during the workweek. An employer of a live-in employee who resides at the home for extended periods of time may exclude from hours worked up to eight hours per night of sleep time as long as the employee is paid for at least eight hours during the relevant 24-hour period. The Bulletin clarifies that, although “in most cases,” private quarters means a separate bedroom, this is not a bright-line rule and the WHD will consider the particular circumstances of the case. It provides the following example: “if a home care worker provides live-in services to an individual who does not have a residence with enough space to give the worker her own bedroom but the home is arranged in a manner designed to give the employee as much privacy as reasonably possible, that arrangement could fulfill this requirement.” It elaborates that: (i) “[t]his space must be furnished with, at minimum, a bed, lighting, and a dresser and/or closet in which to store clothing and other belongings;” and (ii) “[t]he employee must be able to leave her belongings in this room during on-duty and off-duty periods.” The private quarters will be considered to be in a “homelike environment” when the space includes facilities for cooking and eating, a bathroom, and a space for recreation, whether shared by the provider and consumer and/or other household members. For those employees who do not qualify as live-in employees but are on duty for 24 hours or more, sleep time of up to eight hours may be excluded from hours worked when (1) the employee is provided with "adequate sleeping facilities," (2) he or she "can usually enjoy an uninterrupted night’s sleep," and (3) the parties have an "expressed or implied agreement" to exclude the sleep time. To exclude sleep time for employees who are on duty for 24 hours or more, the employee need only have access to “adequate sleeping facilities,” meaning access to basic sleeping amenities, such as a bed and linens; reasonable standards of comfort; and basic bathroom and kitchen facilities, which may be shared. Unlike for live-in employees, the sleeping area need not be private. The Bulletin clarifies the WHD’s enforcement position on whether an employee can “usually enjoy an uninterrupted night’s sleep,” as set forth in 29 C.F.R. § 785.22(a). WHD takes the position that five consecutive hours of sleep without interruption constitutes an “uninterrupted night’s sleep” and that an employee can “usually” enjoy that uninterrupted night’s sleep if he or she is getting that type of sleeping period at least half the time. Section 785.22(b), on the other hand, addresses whether, on any particular night, the employee has gotten enough sleep to reasonably permit the exclusion of any portion of her regular sleeping period, assuming the requirements of Section 785.22(a) are met such that an employee’s sleep time is usually excluded from her hours worked. In that instance, the five hours need not be continuous, but interruptions must not be so frequent as to prevent reasonable periods of sleep that add up to at least five hours. The Bulletin reiterates the requirement that there must be an express or implied agreement, and that agreement may be evidenced by the parties’ conduct. However, the Bulletin counsels investigators to account for any evidence that the employee has objected to the exclusion of sleep time from her hours worked. As such, employers should have an agreement in writing and signed by the caregiver. Employees who work shifts of less than 24 hours must be paid for all hours worked during the shift, and no sleep time may be excluded even if the worker sleeps during the shift. The Bulletin also notes that two additional limitations are applicable to both live-in employees and employees who are on duty for 24 hour or more: (i) any interruption of what might otherwise be properly excluded sleep time by a call to duty must be treated as hours worked; and (ii) if on a particular night the employee does not get reasonable periods of uninterrupted sleep totaling at least five hours, no sleep time may be excluded. The DOL’s Home Care Rule appears to be here to stay. Given the increased risk of both litigation and the DOL’s increased scrutiny of the industry, home care companies should be vigilant in their efforts to comply with the FLSA’s minimum wage, overtime, and recordkeeping requirements. Moreover, companies that associate with independent contractor home care workers should conduct a thorough review of their practices and assess whether those workers are appropriately classified as independent contractors. 1 Littler represented the Home Care Association of America, the International Franchise Association, and the National Association of Home Care & Hospice, the co-plaintiffs in this case. 2 See Angelo Spinola and Lucas E. Deloach, D.C. Federal Court Vacates Regulation Excluding Third-Party Employers from the FLSA Companionship and Domestic Services Exemption, Littler ASAP (Dec. 22, 2014). 3 See Maury Baskin, Angelo Spinola, and Lucas E. Deloach, Federal Court Vacates Second and Final Major Provision of the Department of Labor's Home Care Rule, Littler ASAP (Jan. 14, 2015). 4 See Angelo Spinola and Lucas E. Deloach, The Department of Labor Appeals Federal Court's Orders Vacating Both Major Provisions of the Home Care Rule, Littler ASAP (Jan. 23, 2015). 5 See Angelo Spinola, Maury Baskin, and Lucas E. Deloach, D.C. Circuit Upholds DOL’s Home Care Rule; Further Appeals Likely, Littler ASAP (Aug. 24, 2015). 6 See Angelo Spinola and Lucas E. Deloach, Court Enters Summary Judgment in Favor of DOL in Home Care Rule Challenge, Littler ASAP (Oct. 22, 2015). 7 See Angelo Spinola and Lucas E. Deloach, Home Care Industry Coalition Seeks Supreme Court Review of DOL's Home Care Rule, Littler ASAP (Nov. 19, 2015). 9 See Tammy D. McCutchen and Michael J. Lotito, DOL Issues Guidance on Joint Employment under FLSA, Littler ASAP (Jan. 20, 2016). 10 The AI, for example, declares the joint employment standards adopted by the First and Third Circuit Courts of Appeal to be “not consistent with the breadth of employment under the FLSA.” It seems unlikely that these circuits will abandon their own cases law in deference to the new AI. 11 Department of Labor, Wage and Hour Division, Administrator's Interpretation No. 2016-01 (Jan. 20, 2016), available at http://www.dol.gov/whd/flsa/Joint_Employment_AI.pdf.